Facebook could pay as much as $1 billion for Waze, according to two unnamed sources who spoke with Bloomberg. Talks between the two companies are not final, those people said, and could eventually fall apart. The move would allow Facebook to compete with the likes of Apple, Google, Microsoft, Nokia and others who have their own mapping solutions. There were rumors early this year that Apple was potentially interested in buying Waze to bolster its own Maps application for iOS, but those claims turned out to be inaccurate. Apple did, however, promote Waze as a potential alternative when the company apologized to customers who felt that Apple's new mapping solution, which debuted in iOS 6, was substandard. 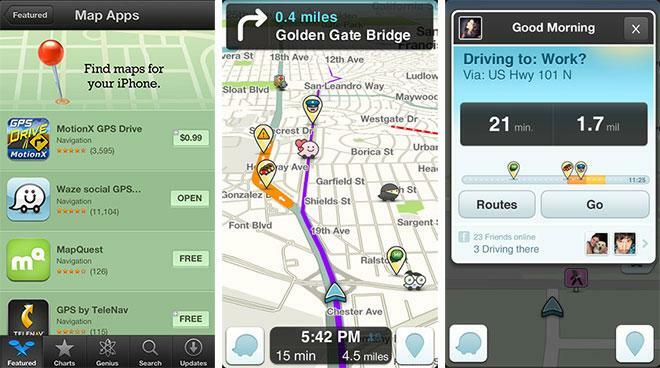 Waze is available for iOS as a free download on the App Store. The company claims more than 30 million people use the service as a "fun, community-based traffic & navigation app." With Waze, users share real-time information on traffic congestion, gas prices, accidents, speed traps, checkpoints and more. Some data is automatically reported by simply having the iPhone application open while driving.